In the second volume of the "Great Lives" series, Charles Swindoll celebrates the story of Esther and reveals how every Christian can live a transformation story. 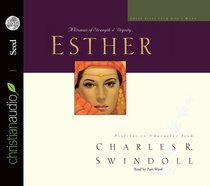 About "Esther (6 CDS Unabridged) (Great Lives From God's Word Series)"
Charles R. Swindoll is senior pastor of Stonebriar Community Church, Frisco, Texas, and host of a leading program in Christian broadcasting, Insight for Living which airs in major Christian and non-Christian radio markets throughout the world and to a growing web-cast audience. Chuck's extensive writing ministry has also served the body of Christ worldwide, He has written more than thirty best-selling books, such as Strengthening Your Grip; Laugh Again, and the Great Lives series, including Paul: A Man of Grace and Grit. His leadership as president and now chancellor of Dallas Theological Seminary has helped prepare and equip a new generation for ministry. Chuck and Cynthia, his partner in life and ministry, have four grown children and ten grandchildren. In the first and best-selling Great Lives book, Great Lives: David, Dr. Swindoll explores the Old Testament shepherd, king, and psalmist, to answer the question, "What does it mean to be someone after God's own heart?" In many ways he was a most extraordinary man - intelligent, handsome, abundantly gifted as a poet, musician, warrior, and administrator. Yet in other ways he was a most ordinary man - often gripped by destructive passion, rocked by family chaos and personal tragedy, and motivated by political expediency. How did David become the national hero of God's chosen people? Why is he the one character in the Bible described as a "man after God's own heart"? Chuck Swindoll explores the many facets of David - from his teenaged years and dysfunctional family life to his overwhelming passion for God. Shepherd, king and psalmist, David had the charisma to inspire a nation. He was also often gripped by destructive passion, rocked by personal tragedy, and motivated by political gain. Yet, he is the one character the Bible describes as a "man after God's own heart." Discover why. 304 pages, from Nelson. Unavailable. We are unsure when this item will be available to ship. Other edition is available. 9781400280322 0 Available. The best-selling Great Lives series continues as Swindoll chronicles the life of one of God's greatest prophets. Elijah stood up against the most powerful authority of his time, called fire down from heaven, and yet faced a tremendous battle with depression. His story reveals a God who remains with us at all times.